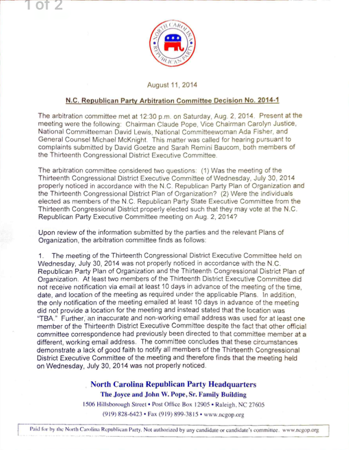 In August of 2014, the NCGOP Arbitration Committee met to consider the legitimacy of the July 30 2014 Thirteenth Congressional District Executive Committee meeting, and of elections held at that meeting. 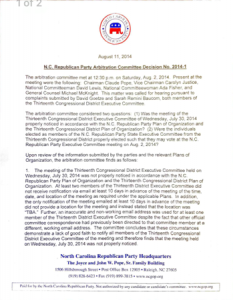 The Arbitration Committee ruled that the July 30th meeting was not properly noticed to all 13th CD ExCom members, elections held at that meeting were not valid, and those elected were not eligible to be seated or vote at the August 2, 2014 NCGOP ExCom meeting. Images (we apologize for the quality) of the Arbitration Committee’s report are available at the end of this article. What does this establish? That votes taken at an improperly-noticed meeting are not valid. 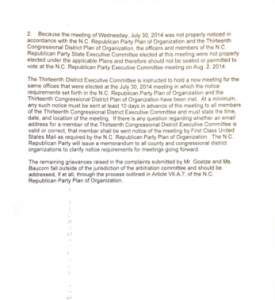 The March 20, 2016 meeting of the NCGOP Central Committee was not properly noticed. Meeting notice was not delivered within the required timeframe, and the notice failed to specify the business of the meeting. The meeting notice was postmarked March 11, 2016, just nine days in advance of the meeting, thus a clear violation of Article VII.J.1 of the NCGOP Plan of Organization. During this improperly noticed meeting, the Central Committee was informed by members it was out of order, yet still deliberated and approved sending to the Executive Committee a petition seeking removal of the Chairman. 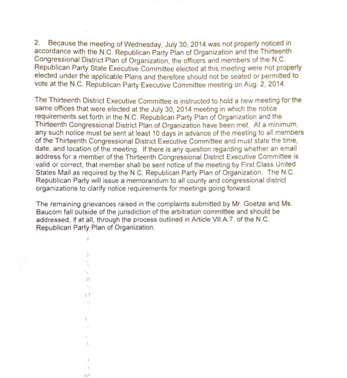 The NCGOP Plan of Organization is silent on the consequences of conducting an improperly called meeting; however, Robert’s Rules of Order, Newly Revised (RONR), §23 page 251 clearly establishes that the continuing breach renders the resulting actions during the March 20, 2016 meeting out of order, regardless of when the point of order was called. All votes taken – including the votes to approve and forward the petition for the Chairman’s removal – are null and void. March 20 meeting was not properly noticed, therefore votes taken there are null and void. Since the petition calling the April 30 meeting originated at the March 20 meeting, the petition calling the April 30 meeting is null and void. Since the April 30 meeting is null and void, so are the votes to remove Chairman Hasan Harnett and elect Robin Hayes in his place. So, how did they remove Chairman Harnett and elect Robin Hayes at the April 30 meeting? Simple, they bent, broke, and invented rules. A hired gun parliamentarian was brought in to ensure not that justice was done, but that a desired result was achieved. I wonder how much THAT cost NCGOP (us)? Our apologies for the quality of the images below. It may help that if you click them, they should open in a new browser window or tab. Previous Previous post: Chairmain Harnett: See you in Greensboro!